Lot Size : 7,405 sq.ft. Move right into this Bright & inviting 2006 custom built Colonial nestled in a quiet dead end street in desirable South Dartmouth neighborhood. This homes features 1st floor open floor plan with dining room, ½ marble bathroom, laundry & soaring ceilings in Foyer. 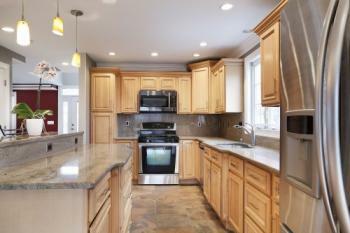 Gorgeous kitchen with large island, granite counter tops, stainless steel appliances & a casual dining area. The Oversized Great room has gas fireplace & sliders to the private backyard situated on a level lot, great for entertaining. Tastefully landscaped with a stamped concrete patio, Japanese maple, hydrangeas, lavender & herbs. The master suite has a large walk-in closet, a gorgeous bathroom that has a shower, jacuzzi tub & granite double sinks. Two more bedrooms on 2nd floor & guest bathroom. Hardwood floors & recessed lighting throughout. Basement offers an abundance of extra storage & walks out to backyard. Conveniently located close to areas shops, Padanaram Village, restaurants & major highways. A spectacular property for easy living!